Moldy History | Dapper Cadaver Blog » Gothic, Horror & Halloween! NPR ran a great story last week called Bone to Pick: First T. Rex Skeleton Complete at Last. Carl Mehling, curator at the American Museum of Natural History in New York, found a stray bone labeled 973, identified as belonging to the first T. Rex and gave it to the Carnegie Museum to finally complete the first T. Rex skeleton.But the best parts of the story for me were about the man who discovered the first T. Rex skeleton and sold it to the Carnegie Museum in the first place: Barnum Brown, “the Indiana Jones of dinosaur hunters”. Named after P.T. Barnum, Brown was a pioneering dinosaur hunter who traveled extensively, dressed nattily, lived through personal tragedy and had many a romance, including his second wife Lillian who wrote a memoir called I Married A Dinosaur. He also served as a dinosaur expert on such films as Fantasia. Remember the amazing dinosaurs in The Rite of Spring? There is a good Barnum Brown biography at Strange Science if you want to learn more. I’m going to have to pick up the book on him that came out last year, Barnum Brown: The Man Who Discovered Tyrannosaurus rex. From the review at the Smithsonian blog, it sounds like a great read. laboratory essentials, originally uploaded by Boju. WARNING: This article contains images and material that may be upsetting to some readers. While Dr. Victor Frankenstein is the epitome of the movie Mad Scientist, his experiments in reanimating the dead are positively tame compared to some of the real life beaker jockeys who earn the title. For starters, Dr. Frankenstein’s victims were already dead, and were criminals to boot. The most common victims of mad science are innocent animals. With that said, let’s get mad! 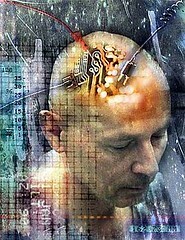 Dr. Delgado invented a radio controlled mind control chip he called the stimoceiver which could be used to stimulate emotions and control behavior. It produced a variety of effects, including pleasant sensations, elation, deep, thoughtful concentration, odd feelings, super relaxation, colored visions, and other responses. Delgado stated that “brain transmitters can remain in a person’s head for life. In a famous demonstration he stood in the path of a charging bull and caused it to turn away with his stimoceiver. DIY Laboratory of Dr. Delgado: Brains, stuffed monkeys in cages, brains in jars, miscellaneous remote controls and circuitry, brain plasma ball. Dr. Thomas park studies unusual sensory perception amongst mammals, which means his research is dedicated to the creepiest of creatures – Bats and Naked Mole Rats. While we all know bats are the air born form of vampires, many people have not been exposed to the shivering pink mass of flesh and teeth that live like a termite and look like an abortion. 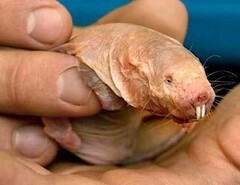 MAD SCIENCE EXPERIMENT: Mole rats cannot be burned with acid. “”Their insensitivity to acid was very surprising,” Park told LiveScience. “Every animal tested â€” from fish, frogs, reptiles, birds and all other mammals â€” every animal is sensitive to acid.” Was Park just throwing acid on a random assortment of creatures to test his theory that they hate it? And what did he do once he discovered mole rats couldn’t be burned? He genetically engineered a cold sore that would make them burnable again. DIY Laboratory of Dr. Thomas Park: Laboratory glassware full of colored fluid labeled “Acid,” dry ice to make them bubble and smoke, habitrails, bats, naked mole rats. Warren Thomas is a scientist who did a lot of acid in 1962. So much so that he thought it would be a good idea to dose an Elephant with LSD. 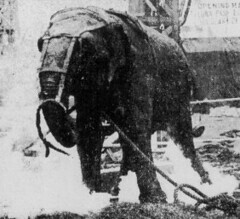 The elephant, named Tusko, died almost immediately. He claimed in his defense he didn’t expect that result, saying he had done plenty of acid himself with no ill effects. What he did expect was the elephant to fly into a psychotic rage, much better right? 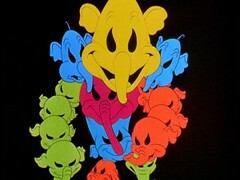 Warren Thomas remains the only person who can positiely claim to have done enough LSD to kill an elephant. Robert Cornish is a scientist who, in Berkley, CA, 1930, managed to resurrect 2 dead dogs by placing them on a seesaw to circulate the blood and injecting them with a mixture of adrenalin and anticoagulants. Not surprising he was able to find a human volunteer for his experiments with a man condemned to be executed, and the state denied him permission for fear he could do it. DIY laboratory of Dr. Robert Cornish: 2 dead looking stuffed dogs, a seesaw, scary large syringes, laboratory glassware, dog skeletons, dog anatomy charts and models, an electric chair. 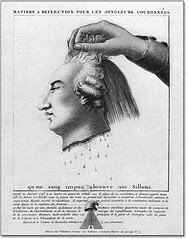 During the head chopy frenzy of the French revolution, Beaurieux decided to test the hypothesis that the head survived the blade for about half a minute. He discovered that immediately after decapitation the eyelids and lips of the guillotined man worked in irregularly rhythmic contractions for about five or six seconds. In another experiment he yelled at the severed head, it apparently opened it’s eyes in response to it’s name. 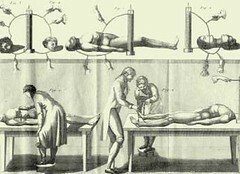 DIY Laboratory of Dr. Beaurieux: A guillotine, severed heads. 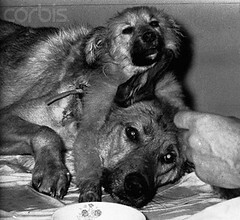 In the words of Roky Erickson, “2 headed dog, 2 headed dog, I been working in the Kremlin for a 2 headed dog.” Demikhov is famous for the first successful head transplant in which he severed the head of a puppy and attached it to the neck of a full grown dog. Both heads survived and were hungry. DIY Laboratory of Dr. Demikhov: stuffed two headed dog, two headed anything, tubes, laboratory glassware, cages, a copy of the song “Two Headed Dog” by Roky Erikson. Most famous for inventing the Galvanizing process for metals, the good Dr. also experimented on galvanizing human and animal corpses as a spectacular public show. An eyewitness reported: “Aldini, after having cut off the head of a dog, makes the current of a strong battery go through it: the mere contact triggers really terrible convulsions. The jaws open, the teeth chatter, the eyes roll in their sockets; and if reason did not stop the fired imagination, one would almost believe that the animal is suffering and alive again”. In another show, Aldini pioneered electrocuting the brains of the mentally ill as a means of supposedly helping them. DIY Laboratory of Dr. Aldini: corpses, body parts, plasma balls, electrodes, autopsy instruments, electric chair, straight jackets. 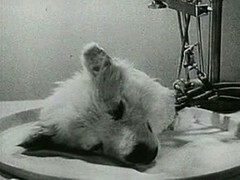 Many of us owe Dr. Brukhonenko a life debt for his invention of open heart surgery procedures, but along the way to saving human life, he discovered the means to keep a dogs head alive without a body. DIY Laboratory of Dr. Brukhonenko: Stuffed dogs head, laboratory glassware, dog skeleton, canine anatomy charts and models, open heart body, heart models. 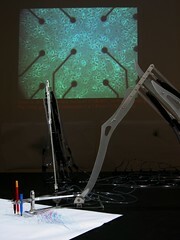 DIY Laboratory of Guy Ben Ary: robot arms, mice, habitrails, robots, human skin. Another contemporary scientist pushing the boundaries of art, science, and performance. 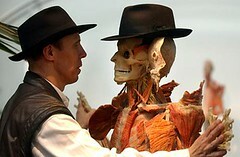 Von Hagens invented a way of turning human corpses to plastic so he could exhibit them in surreal, statuesque dissected poses which he is currently touring the country with. He was also once arrested for doing an unauthorized pubic autopsy exhibition. DIY Laboratory of Dr. Von Hagens: Skinned bodies, laboratory glassware, severed limbs, specimen jars, autopsy table, shovel, autopsy instruments, embalming pumps, corpses. Also known as Satans rocket scientist, Parsons is a founding member of NASA’s Jet Propulsion Lab (JPL) and follower of Occultist Aleister Crowley. He had little formal education but was instrumental in developing jet and rocket fuel. He was known to engage in bizarre orgies and invoke the great god Pan before launches. He officially died in his garage when a fuel he was mixing exploded, but conspiracy myths abound. DIY Laboratory of Jack Parsons: Necronomicon, human skulls, occult objects, laboratory glassware, model rockets, globe, moon model, star map, pentagram, black robes, astronaut suit. 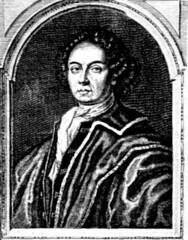 Lord Dippel worked in the most famous laboratory in the world, Castle Frankenstein. Yes, THE Castle Frankenstein. It’s real and so is he. His experiments in anatomy, immortality, alchemy, and alleged grave robbing may have inspired the tale of another famous resident of Castle Frankenstein. 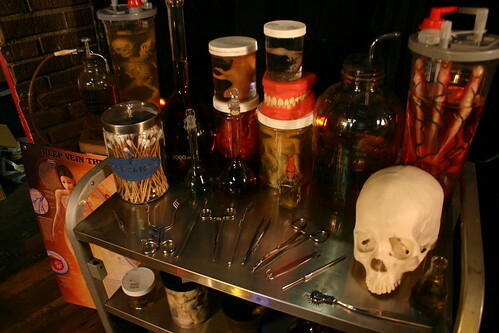 DIY Laboratory of Lord Dippel: Autopsy tables, laboratory glassware, vintage laboratory glassware, corpses, severed body parts, gravestones, specimen jars, plasma balls, autopsy instruments, a shovel. What makes a mad scientist? Some are crazy, some are angry, many are both. Thomas Edison falls into the middle category, the angry scientist. After inventing DC electricity, his rival Westinghouse came out with AC electricity (invented by Tesla see #1). Determined to show just how dangerous Westinghouse’s product was, Edison invented the electric chair and went on an electrocution tour – using Westinghouse’s AC current to kill people. That would be like Henry Ford getting into a Chrysler and running people down to show how dangerous Chryslers are. The word electrocution hadn’t been coined yet, so he called death by electricity “Westinghousing.” His finest achievement from this period was when he Westinghoused a rampaging circus elephant. with a custom elephant sized electric chair headpiece. DIY Laboratory of Thomas Edison: electric chair, light bulbs, knobs, switches, plasma balls, human skeletons, human skulls, charred corpses. 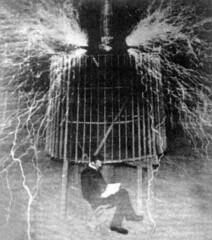 No living man has ever been closer to a comic book super scientist then Nikola Tesla. He pioneered the radio and radio control technology which seamed like magic at the time but we now take for granted. He also invented a number of things that will always seem like magic, including the spark shooting Tesla Coil, light bulbs that glow from no known power source, and a pocket sized device that could create devastating earthquakes. His eccentric mannerisms and bizarre vaguely Austrian (actually Serbian and trans-European) accent lead to the iconic german Mad Scientist of film, television and cartoons. DIY Laboratory of Dr. Tesla: Tesla Coils, plasma balls, anything that sparks or glows, switches, knobs, wires, and tubes. chick halloween 1, originally uploaded by Boju. In my previous post on the History of Halloween I kind of glossed over a very important aspect of the Holiday – Trick-Or-Treating. Well, I woke up that morning and found my blog TPed, my computer screen soaped, and a smashed pumpkins in my comments. So I better clear things up or smell some feet. There are 2 persistent myths about the origins of Trick or Treating. 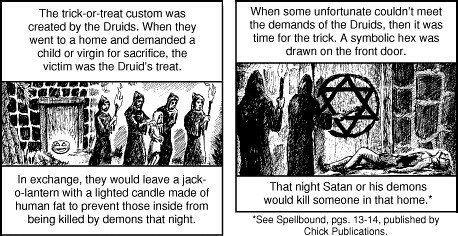 One is that it originated from the Druids going door to door for sacrafices (see image above) and the other is that it originated from Mischief Night in the UK. Like a good horror movie, both stories make great spooky stories to tell yourself on Halloween, but shouldn’t be taken seriously at all. The above comic sets up the traditional Protestant Christian belief that Halloween is Satanic in origin and Druids or witches spent the night going door to door kidnapping virgins to be raped and sacrificed to Satan. Jack-O-lanterns were left with candles made of human flesh. Note that I’m drawing a distinction between Protestant Christians and Catholic Christians. Part of the anti-Halloween vibe stems from the conflicts between Catholic Ireland which celebrated Samhain and Halloween and Protestant England which liked neither Catholics nor the Irish and celebrated Guy Fawkes day. Catholics tend to see the connection between All Souls Eve, The Day of the Dead, and Halloween without too much of a fuss. As for Halloween, it was never celebrated by the druids. The druids of Ireland celebrated Samhain. When Ireland went Catholic they started celebrating Halloween. But names and religions aside, there is also no record of druids going door to door on Samhain or collecting sacrifices. The celebration of Samhain involved bonfires, fortune telling, dancing, apple bobbing, and a harvest feast. The druids were pagans and part of their culture had some witchcraft elements, but they did not worship Satan, who is part of the Christian cosmology. Jack-o-lanterns came with the switch to Halloween, but they were carved turnips, not pumpkins, and were lit with ordinary candles or coal. According to legend, there was an Irishman named Jack, who was renown for his drunkenness and meanness. When it came time to die, the Devil came to collect his soul. Jack begged him for one last drink and tricked the Devil into turning into the coin to pay for it. Instead of going into a bar with his Satanic coin, Jack put it in his wallet, which bore a cross on it, trapping the Devil. Desperate, the Devil offered Jack one more year of life if he let him out. One year latter the Devil came for Jack again. This time Jack begged the devil for one last apple, and tricked the Devil into climbing an apple tree. While the Devil was in the tree, Jack drew a cross on the tree, trapping the Devil. 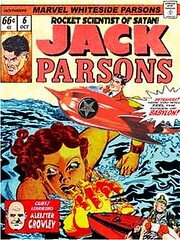 Furious, the Devil offered Jack 10 more year of life if he let him down. So Jack was forced to wander in limbo between earth and the afterlife. He asked the Devil how he could light his way, and the Devil gave him a coal of hellfire, which Jack put into a turnip and carved a face on. Since the Devil wanted nothing to do with Jack, the Jack-o-lantern was placed at doors and windows to welcome in lost souls and scare away devils and demons. So the original Jack O Lantern did burn hellfire, but aside from that was pretty anti-satanic. Plus, the devil in that story is so stupid. The Irish brought Halloween to America in the late 1800’s, but Trick-or-Treating didn’t appear until the 1930’s. Until then, the two were completely unrelated, and above all else, Halloween and Trick-or-Treating are not Satanic. From “Lo!” by Charles Fort, 1931. It is, I believe, a detailed account of 100 years of Chupacabra attacks in the UK and the Old World. was aroused. It became a religious duty to hunt this marauder. Once, when hunters rode past a church, out rushed the whole congregation to join them, the vicar throwing off his surplice, on his way to a horse. Milking, cutting of hay, feeding of stock were neglected. For more details, see Chambersâ€™ Journal, 81-470. Upon the 12th of September, someone saw a dog in a cornfield, and shot it. 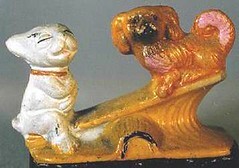 It is said that this dog was the marauder, and that with its death the killing of sheep stopped. For about four months, in the year 1874, beginning upon January 8th, a killer was abroad, in Ireland. In Land and Water, March 7, 1874, a correspondent writes that he had heard of depredations by a wolf, in Ireland, where the last native wolf had been killed in the year 1712. According to him, a killer was running wild, in Cavan, slaying as many as 30 sheep in one night. There is another account, in Land and Water, March 28. Here, a correspondent writes that, in Cavan, sheep had been killed in a way that led to the belief that the marauder was not a dog. This correspondent knew of 42 instances, in three townlands, in which sheep had been similarly killedâ€”throats cut and blood sucked, but no flesh eaten. The footprints were like a dog’s, but were long and narrow, and showed traces of strong claws. Then, in the issue of April 11th, of Land and Water, came the news that we have been expecting. The killer had been shot. It had been shot by Archdeacon Magenniss, at Lismoreville, and was only a large dog. This announcement ends the subject, in Land and Water. Almost anybody, anyway in the past, before suspiciousness against conventions had the development that it has today, reading these accounts down to the final one, would sayâ€””Why, of course! It’s the way these stories always end up. Nothing to them.” But it is just the way these stories always end up that has kept me busy. Because of our experience with pseudo-endings of mysteries, or the mysterious shearing and bobbing and clipping of mysteries, I went more into this story that was said to be no longer mysterious. The large dog that was shot by the Archdeacon was sacrificed not in vain, if its story shut up the minds of readers of Land and Water, and if it be desirable somewhere to shut. up minds upon this earth. The scene of the killings shifted. It seems that some of the killings were simultaneous near Cavan and near Limerick. At both places, it was not said that finally any animal, known to be the killer, was shot or identified. If these things that may not be dogs be, their disappearances are as mysterious as their appearances. London Daily Mail, December 19â€””Marauder shot near Hinton.” It was a large, black dog. that stopped mystification and inquiry, in the minds of readers of the Bristol Mercury. We learn that the large, black dog had been shot upon December 16th, but that in its region there had been no reported killing of sheep, from about November 25th. The look of data is of another scene-shifting. Near Gravesend, an unknown animal had, up to December 16th, killed about 30 sheep (London Daily Mail, December 19). “Small armies” of men went hunting, but the killing stopped, and the unknown animal remained unknown. London Daily Express, Oct. 14, 1925â€”the district of Edale, Derbyshire, terrorized, quite as, centuries ago, were regions by stories of werewolves. Something, “black in color and of enormous size,” was slaughtering sheep, at night, “leaving the carcasses strewn about, with legs, shoulders, and heads torn off; broken backs, and pieces of flesh ripped off.” Many hunting parties had gone out, but had been unable to track the animal. “People in many places are so frightened that they refuse to leave their homes after dark, and keep their children in the house.” If something had mysteriously appeared, it then quite as mysteriously disappeared. There are stories of wanton killings, or of bodies that were not fed upon. London Daily Express, Aug. 12, 1919â€”something that, at Llanelly, Wales, was killing rabbits, for the sake of killingâ€”entering hutches at night, never taking rabbits, killing them by breaking their backbones. Daily Mail, March 22â€”that about a dozen of the King’s sheep, in a field near Windsor Castle, had been bitten by something, presumably a dog, so severely that they had to be killed. In the Daily Mail, March 19, is an account of extraordinary killing of sheep, “by dogs,” near Guildford, about 17 miles from Windsor. 51 sheep were killed in one night. There was a panic, and the military authorities were appealed to. 3 officers and 40 men were sent from Moscow. They organized beats that were composed of from 500 to 1,000 peasants, but all hunts were unsuccessful. On the 24th of July, four women were attacked, and one of them was killed. In the Field, Dec. 23, 1893, it is said that, after a study of sketches of the spoor of the animal, the naturalist Alferachi gave his opinion that the animal was a large dog. He so concluded because of the marks of protruding nails in the sketches. 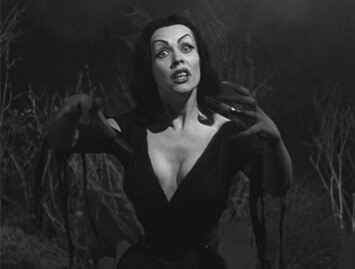 Vampira, also known by her mortal name Mailia Nurmi, passed away yesterday. 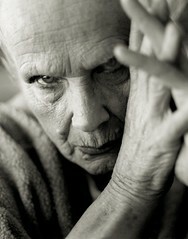 She was 85 or 86, reports vary. Vampira discovered what may be the greatest schtick in the history of mankind during the 1950’s. Inspired by the look of Morticia Addams, Vampira added campy humor, double entendres, B-movies, and unbelievable cleavage. This unstoppable combo has often been imitated, never surpassed. Her most famous performance is as a mute zombie chick who dresses like a vampire in Ed Wood’s opus “Plan 9 from Outer Space,” but what made her a star was her TV Hostessing. Unfortunately footage of her show is incredibly hard to come by, as there are no official recordings. Everything comes in seasons for me, the weekend after Thanksgiving, for instance was all about Headstones. January, it seems is Sideshow time. These long thought mythological creatures are in no way related to humans, but are in fact a curious mammal, distantly related to bats. It’s believed that through the power of flight, these creatures reached far off islands where no other predators existed, and, like countless species of birds in similar situations, lost the power of flight, and began to adapt themselves for swimming, currently living in the intermediary realm of evolution, like seals or penguins. When I die, I hope to be preserved as well as my collections, specifically, I wish to be diaphinized, like my new babies, the diaphinized rat, diaphinized snake, and diaphinized frog. Each one has been chemically treated in a way that not only makes them flamable, but turns soft tissue to clear whitish jelly and stains the bones. That’s it for this week. Who nows what oddities I’ll add to my collection next…perhaps you.